Bedroom apartment type f 45 sq.m. 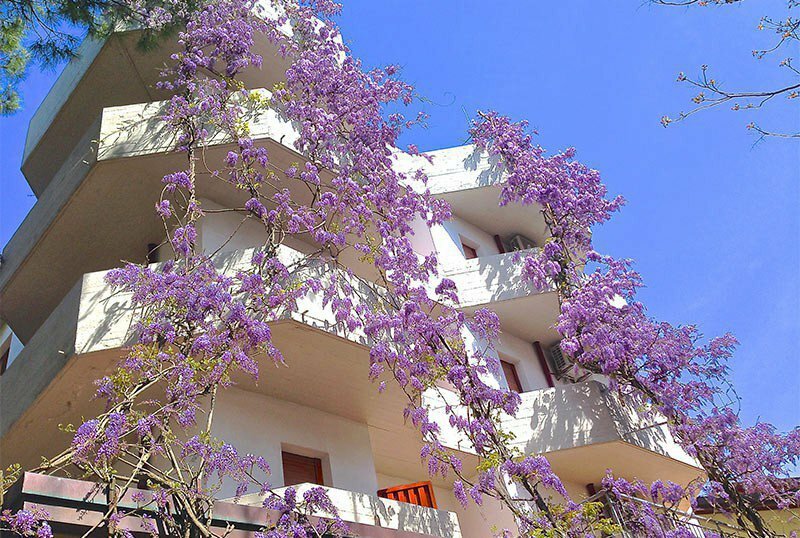 Hotel Residence Piccolo is located in the center of Milano Marittima and offers apartments of different sizes equipped with WI-FI, air conditioning and daily cleaning. The property has an outdoor playground area for children, bicycles available, parking and coin-operated laundry. Admits animals of all sizes. Hotel Residence Piccolo is located in the center of Milano Marittima, less than 5 minutes walk from the beach. There are studios and apartments with fully equipped kitchenette, balcony, air conditioning, heating, WI-FI connection, safe, satellite TV, telephone, bathroom with shower and hairdryer, linen. Baby cots and high chairs are available. The cleaning of the apartment is daily. APARTMENTS of 40/45 sqm: living room with sofa bed, kitchenette, double bedroom and balcony. APARTMENT 30 sqm: like the previous one but without the living room. STUDIO: equipped with double bed, kitchenette, bathroom and balcony. Garden, open-air porch, sun terrace, children's playground area, free bicycles, lift, coin-operated washing machine, drinks dispenser. AIR CONDITIONING : present both in the common areas and in the apartments. SERVICES FOR PEOPLE WITH DISABILITIES: ground floor entrance with sloped ramp, ground floor room with wheelchair maneuvering space, wheelchair access shower. The prices of the price list are for 2 people per week (from Saturday to Saturday). - For each additional person over 2 (even if children): € 50.00 per week or € 10.00 per day. - At the departure the customer must leave the kitchenette perfectly clean. - At the time of booking will be required to pay a deposit equal to about 20% of the total amount of the stay. - Before 02/06 and after 08/09 it is possible to stay less than a week, for bridges, holidays or weekends (see offers or on request). From March 31 we offer comfortable apartments (only accommodation, same comforts and services as a room in the Hotel only with more a kitchenette) from € 30.00 per night per person, even for one night (excluding periods of Easter and bridges). All prices are for 2, 3 or 4 people, minimum 15 days! starting from € 440 per week for 2 people in a 28 sqm studio. up to € 730 per week for 4 people in a two-room apartment of 45 square meters.